Tabitha and Tawny have returned from their holiday and high time too. They have such tales to tell though – I am definitely going next time! They said it was a long time in the trailer, but there was a halfway stop with apples. When they got there, they had a lovely breezy paddock with just enough grass to keep them happy (must’ve been lots to keep Tawny happy) and a field shelter. They weren’t sure what to do with the shelter, although Tabitha did say it would have been handy for scratching her back side of she hadn’t had her new fly rug.If you want to see where they stayed, have a look here: http://www.explorethenewforest.co.uk/carriage_house.htm. It’s all run by a lady called Margaret. There are friends there for company, Polo, Chance and Minstrel the horses, three dogs and some visiting ones, one hen, two ducks and a goose. Tabi and Tawny had three adventures while they were there. The first one was pathfinding through Norleywood, to get their bearings. They said it was lovely! 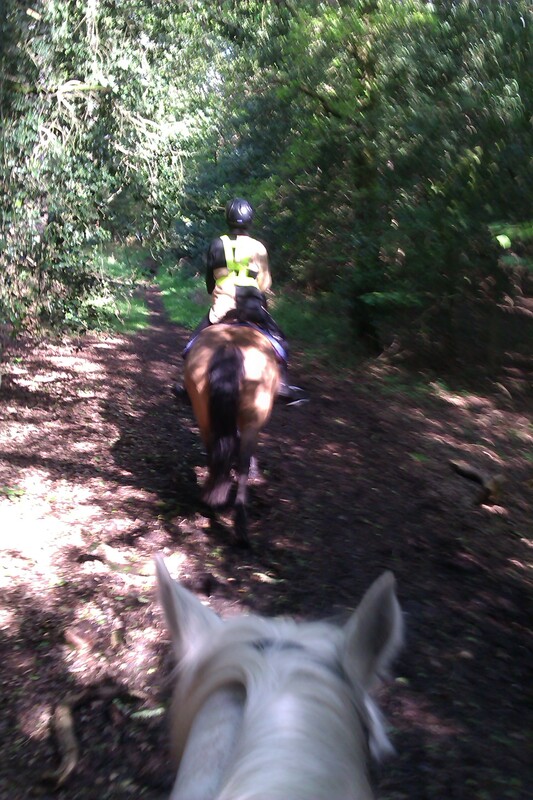 There was only a bit of road and the cars all had courteous drivers, then there were tracks to do trot and canter and there were no hills to wear you out. The next day, they were more adventurous and headed for the second bus stop on the East Boldre road. What with bus stops and silver birch trees moving around like in Harry Potter, they got thoroughly lost and then stuck in a very treacherous bog. Oddly enough, they didn’t take a photo of when Tawny got stuck up to her middle – it was a real tricky moment, but Sarah rescued her and they took a more cautious route home. Day three was the best of all. They started out the way they knew, through Norleywood and across the main road. 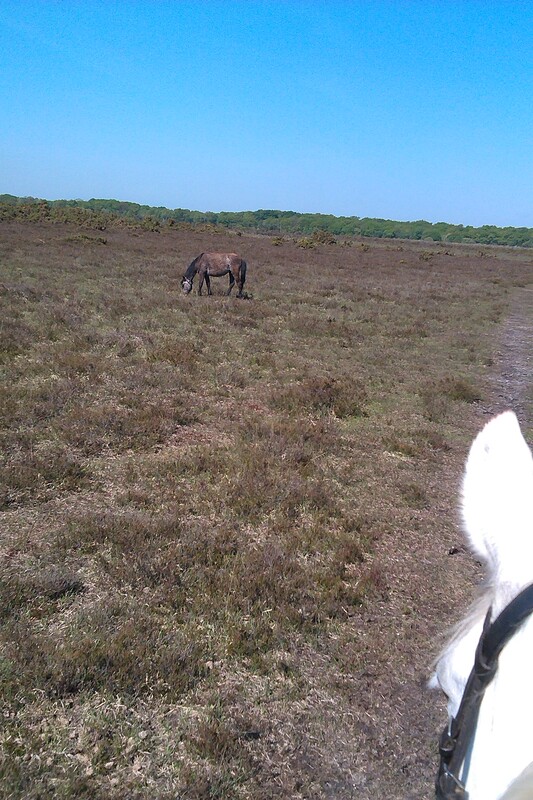 Then Sarah did some nifty map reading and they rode all the way through Crockford Bottom and past the disused airfield to Beulieu Common. They had never seen such wide open spaces before! They have a good understanding, being sisters, and they take turns in going first. 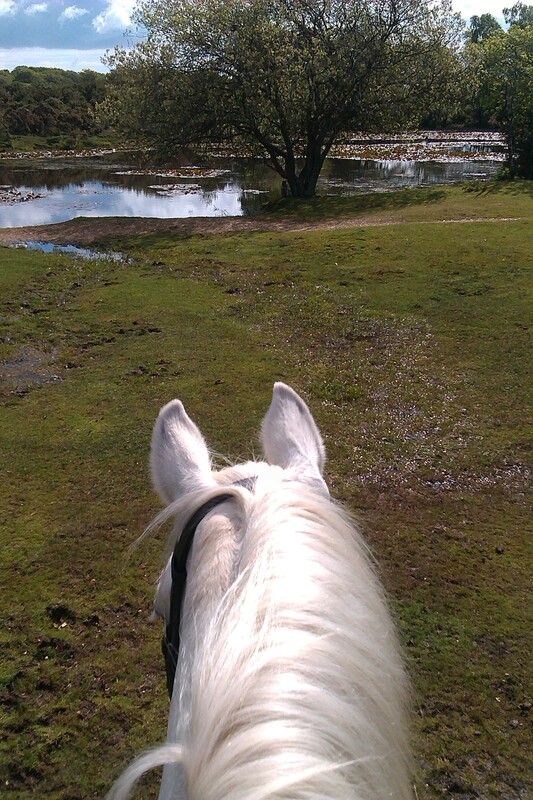 There were lots of trot and canter places across the common – not to mention ponies! Tawny was transfixed each time a new group appeared – is it a bird, is it a plane? 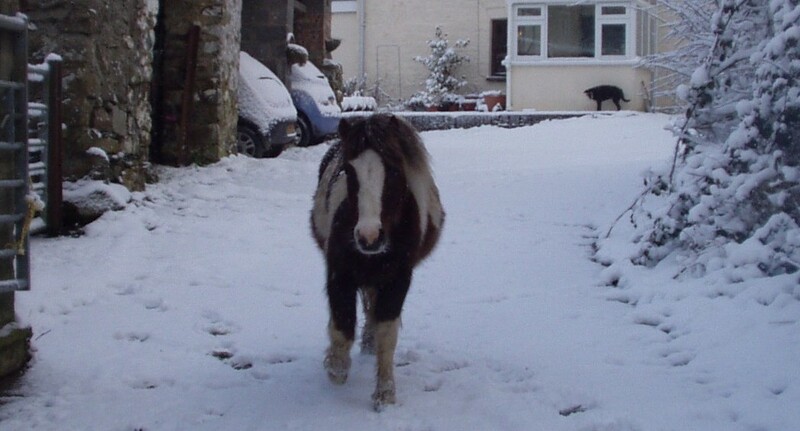 No Tawny, it’s a New Forest pony, still in its winter feathers. 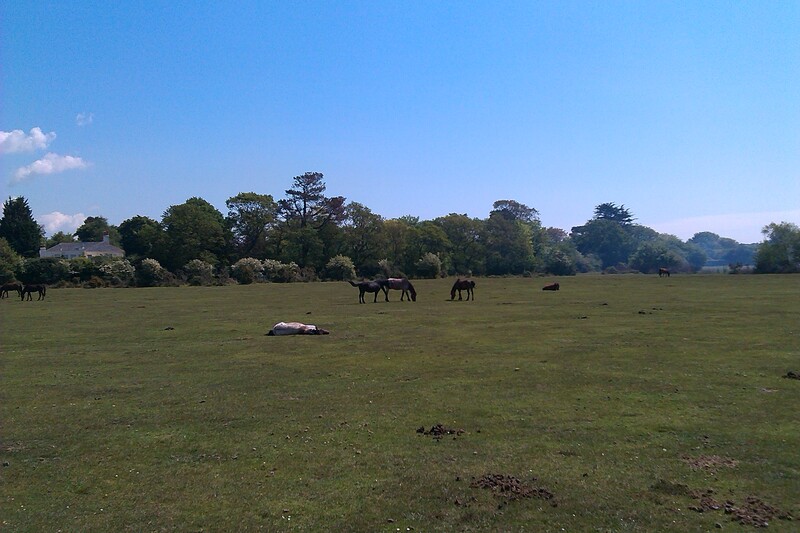 On their way back across the Vicarage Green patch, there was the largest group of ponies, enjoying the sunshine. They took little notice of four Welsh girls passing through, so easily do they co-exist with the other users of the Forest. Now Tawny is famous for being sensible when all others lose their wits (see treacherous bog earlier). However, there are limits to her common sense. 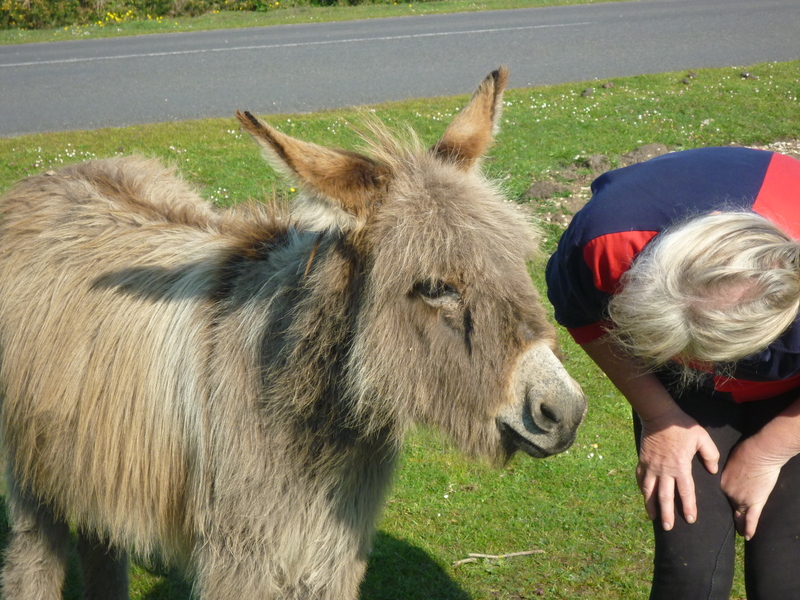 There was a dear little visitor to the gate of the cottage each morning: Tabi was happy to approach and say hello to this funny hairy person, but Tawny was convinced (she has asked me to emphasise this) that this creature was going to eat her alive. Guess this is what happens when you let girls go on holiday unsupervised! 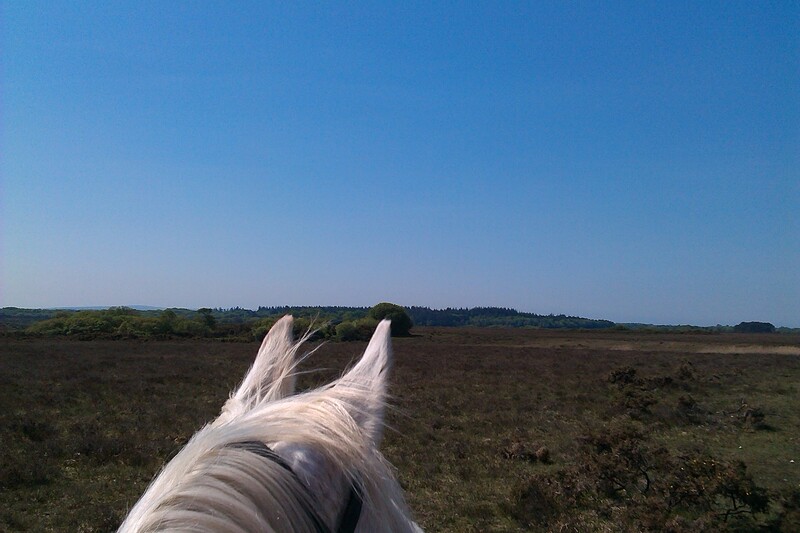 This entry was posted in Life and Times and tagged Beulieu Heath, Carriage Gate Cottage, Donkeys, New Forest Riding Holiday, Off-road riding on May 18, 2014 by sallylearoyd.